The Best Thing for my Family? I’m forging ahead into self employment during the summer, but I am so uncertain if it really is the best direction to go in. I have a young family to care for and the practical side of me is telling me not to do it – the financial side is so uncertain at the moment, while the rest of me is saying that it is the best thing for me to do for my own happiness which is more important and if I am happy then my family will be happy. Should I really go ahead with self employment or find a job? I’m going to suggest you focus on two cards. First, let’s take a look at Temperance. The Temperance card isn’t about a bunch of Carrie Nation smashing beer barrels, it’s a card about the need for balance and moderation, the alchemy of creating harmony in your life. It’s probably a bit of an oversimplification to assume that if a parent is happy her children will be. If you suddenly decided to abandon your family to pursue your dream of being a pole dancer, this would not necessarily make your family happy. However, your focus seems to be that a full time job will be the best way to go financially and that will make them happy and you not so much. But does financial security buy happiness? It may play a role but it’s not necessarily the whole enchilada. How much is enough? Here’s where “balance” and “moderation” come in. You need to figure out how much money your family requires to feel secure. It may come down to making your home payments and putting food on the table. We live in an amazingly status hungry age where parents feel guilty if they can’t provide their children with the latest toys and gadgets, where even young children eye each other’s designer outfits. Are they happier for it? Fortunately, you live in a land where health care is universal and universities can be free. Many parents choose to spend more time at home even at a financial sacrifice because they believe that will make their family happy. Weigh all the factors. Given that it will take you time to build with self-employment, will there be enough for the necessities? If not, how will you live? Do you have the skill-set and expertise that will make you successful at self-employment? If not, what do you need to learn? The other thing to consider is this: Are you the sole possible breadwinner in your family or is there a partner who could perhaps be contributing more? If you are planning to go the self-employment route, this could eventually give you the financial security you seek, but it will take time. Is your partner willing to give it you? That may also mean making certain commitments on your part about setting and achieving realistic goals and objectives — developing a business plan and sharing it with your better half. If your family really needs more income now, then you might want to find something that will pay the bills. This doesn’t mean that you need to give up on moving forward, but it might necessitate getting more support from your family, so that you can do both. You won’t get that if you don’t ask for it. Developing other options will help everyone. Even if you find something full time, these are uncertain times and you might find yourself in this situation again, so developing a skill you can turn into your own business or use in future employment is in your best interest and that of your family. If a part time job will be enough and allow you time to work on your other goals, that may be the best solution, even if that job is less prestigious than you’d like. The key is balance and moderation. This not only means mixing elements, but also discarding that which you don’t need. 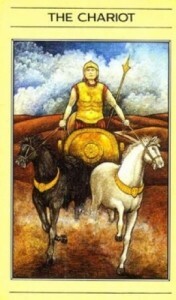 Now here comes the second card — The Chariot. The Chariot like Temperance involves the need for harmony. All the parts need to work together to make it go. . Notice in this image the horses seem to be going in two different directions. You get further when everyone is going to the same place. You have your dreams. You also have dreams for your family. Your partner may have his or her own dreams, and your kids — even if they are very young, may have their own valid ideas. Make sure you are all working toward the same goals, including supporting each other’s individual ones. Try to focus on the long term. No matter what decision you make now, where do you want to be in five years? What gets you there? Temperance and The Chariot are the images you need to focus on — balance and moderation but also harnessing your energy to reach a goal. This is not work you do alone, but in harmony with your family. Skeptical Tarot invites you to comment on this advice and/or help the querent by writing your own (with or without cards). If there’s an issue about which you’d like some free advice, please send your query to skepticaltarot@gmail.com. Please keep queries under 300 words and let me know how you would like to sign off — anonymously, with a link to a website, etc. Not all queries will be selected and queries may be edited for length. This entry was posted in self help, Tarot and tagged accurate tarot reading, free tarot advice, free tarot reading, tarot, tarot for skeptics. Bookmark the permalink.